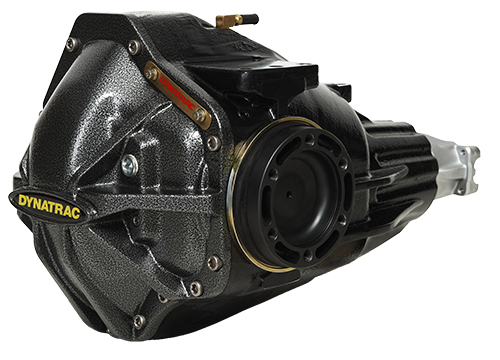 The Dynatrac ProRock 80-IFS/IRS™ provides optimum strength and minimum size in independent suspension systems for vehicles up to 11,000 (4,990 Kg) GAWR. The ProRock 80-IFS/IRS axle features optimum ground clearance, minimum impact area and uses COTS service parts. The patented Dynatrac ProRock® design provides unbeatable ground clearance and reduces the frontal impact area by 30-precent. The smooth bottom of the ProRock XD80-IFS/IRS is engineered to take direct impacts from rocks without the need of a skidplate under the axle. This reduces overall vehicle weight and cost, while providing even more ground clearance. All Dynatrac drivetrain systems are engineered to protect against field failures. These axles are cost-effective to deploy and they accept COTS service parts to make service around the world easy and cost-effective. Click here to download the datasheet on the Dynatrac Defense ProRock 80-IFS/IRS.